← “Trespass”ing at the kennels ! IT WAS a pleasure to welcome Lisa Tyley from Pets at Home today. 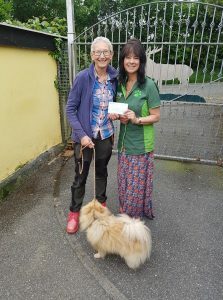 Lisa presented us with a Support Adoption for Pets cheque for £824.25, closely watched by Teddy Pom! K9 Crusaders would like to thank Support Adoption for Pets, Pets at Home, Treliske, and all their customers for their invaluable ongoing support. We are immensely grateful to you all for helping us to help the community.